Jon and Tara Darling sent this recipe for the Porchetta that they made with Lidia, as she filmed her Special, Homegrown Heroes. Watch the video. PREPARE THE SUCKLING PIG - Debone the suckling pig removing the shoulder bones, spine, ribs and leg bones (head is optional). Clean, trim excess fat and pat dry. Lay flat on a large sheet pan. Save the heart, liver and kidneys and a few trims of meat to mince for the sausage mixture. Lightly salt and pepper the entire inside cavity of the suckling pig, sprinkle with several pinches of fennel pollen and grate the zest of one orange down the center. PREPARE THE TENDERLOIN FOR STUFFING - Slice the tenderloin lengthwise down the middle along the fat line. Mince the rosemary needles from 3 stalks with 8 cloves of garlic and mix with 1/4 cup olive oil. Rub this mixture on each tenderloin and season with sea salt + fresh ground pepper. PREPARE THE SAUSAGE FOR STUFFING - Mince the heart, liver, kidneys and meat trim from the suckling and mix with 2lbs ground pork. Season and incorporate with a handful of fennel seed gently crushed with mortar & pestle, a handful of fresh thyme, several pinches of nutmeg, sea salt + fresh ground pepper. STUFF + TRUSS - Place one half of the rubbed tenderloin in the center of the deboned suckling (along the removed backbone), place the sausage mixture down the entire center and top with the other rubbed tenderloin half. Roll both skin sides up to overlap and begin to truss at the head, work down in 1/2” intervals to the tail and tie off. Rub the tightly trussed porchetta roll with olive oil and finish with sea salt. ROAST - Best roasted over fire or on a spit grill. Could also be roasted in a pan in the oven (convection is ideal for crisp skin). Time and temperature will vary depending on the heat source. Ideally roast near 500+ degrees for the first 30 minutes, take the heat down to 325 degrees for a few hours and bring the heat back up to 500+ degrees for the last 10-15 minutes for a beautiful crisp and burnished skin. Baste every 30 minutes with three rosemary stalks twined together. The interior temperature should finish at150 degrees to allow for resting and tender pink meat. REST - Remove the porchetta from the heat and rest for 30 minutes. After 20 minutes begin the remove the twine and use any drippings or crackling bits from the savory porchetta roll to finish greens, potatoes or make a quick reduction. 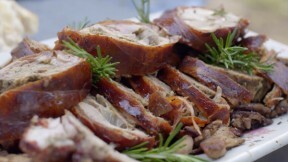 SERVE - At 30 minutes rest, thinly slice the porchetta and serve on a platter. Finish with olive oil, drippings and fresh cracked pepper.